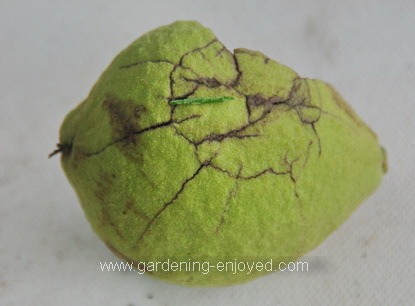 Dallying In The Dirt, Issue #269 - A falling Walnut fails to knock any sense into me. I’m conflicted. 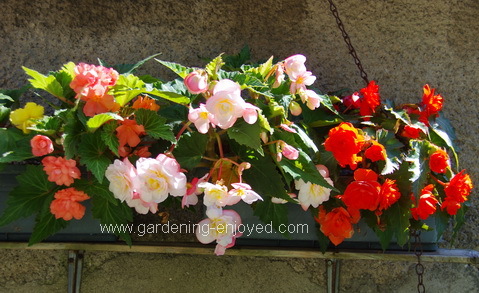 I do love my Tuberous Begonias particularly when they do this. They are spectacular but it’s almost the end of August and they have just recently started being this beautiful. I started them from seed at the end of January and it has been a great experience growing them but I really would like them to look like this, earlier in the summer. This planter and a similar one just down the wall have these marvels blooming in them but they have not thrived in so many other locations. Many have just never developed and many have grown for a while and then rotted at the base of the stem. What have I learned? These ones are in direct sun from about 11:00 am onwards and get plenty of moisture and regular fertilizer. The intense sunlight seems to be the major difference from the other locations and because of that they get watered more frequently. One of the reasons for growing Tuberous Begonias is that they tolerate shade but it appears that they really don’t like to develop in the shade. If I buy the locally available tubers, then I get a bigger plant sooner and the flowers are nice but not as spectacular as these fancy hybrids from Blackmore and Langdon. Maybe this year some of these plants will produce tubers that will be big enough to keep over to next year. I’m a gardener, I may be frustrated by this year’s lack of success but I’m too hard headed to quit trying. Maybe a good knock on the head would make see sense but I tried that this week and I don’t see much change except for a few day’s of headache. I was quietly sitting on the deck enjoying my breakfast when I suddenly felt a huge blow to the top of my head. That big green object is a walnut and I was sitting under its tree. It’s a tall tree so that nut probably accelerated for 25+ meters before finding my head. Luckily it cracked the walnut but not my head although it did knock off my glasses and leave me in a rather dazed state for a considerable period of time. I often wear a hard hat when working near that tree at this time of year because I have seen the force with which those nuts hit the ground but I had just finished and hour or so of watering and other early morning chores and was just quietly reading my paper and relaxing. I continue to have a love/hate relationship with that tree. It is a huge and attractive feature of the back yard and it provides some wonderful deep cool shade for the deck but it drops a mass of fruit that needs to be picked up and its roots inhibit the growth of many vegetable plants. It’s technically my neighbour’s tree so I will get my hard hat out of the cupboard and appreciate its shade while gathering the thousands of bits of shell that the local army of squirrels drops all over the deck. If anything will drive me to move to a gardenless condo, it will be weeds. Ever present, never ending and capable of surviving, no, actually thriving, under heat and drought conditions that keep the desirable plants struggling. Sonchus arvensis must be one of my best friends because this perennial Sow Thistle, takes all the abuse I can heap upon it and returns again and again. This picture is a small section of a bed that has a mass of Narcissus blooming in it during the spring. I finally got around to cleaning it up about three weeks ago and removed several large examples of Sonchus. It has a deep wide ranging root system and I did what I could to remove as much of that root structure as possible. I cannot just dig up the whole area as that would disturb the large cluster of Narcissus bulbs that have been increasing there for several years. Three weeks later those remaining bits of root have produced the solid mass of growth that you can see here. I will go and attack it again and probably slow it down but I’m under no illusions that I could actually eradicate it without also destroying the Narcissus. I am certain that a deep digging and sifting would eliminate the Narcissus but I have grave doubts that it would have the same effect on this noxious weed. 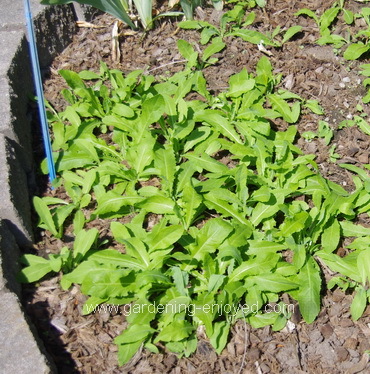 It is a relative of the Dandelion and apparently the young leaves are edible. Maybe I could teach the rabbits to like it and solve a couple of problems together. Valerie Asks? Everything was going fine with my cherry tomato plants until this w/end. All the leaves on the plants are now covered with brown pin holes and the chipmunks have now discovered the plants. They are picking the green ones and leaving them half eaten. Ken Answers! By now, I’m sure the brown pin holes have developed into large brown yellow patches or the leaves have completely dried up. I missed writing last week so the answer is a bit late. Early Blight, a fungus disease, eventually catches up with most of our Tomatoes. Cutting off any leaves that appear infected will help and you can spray with a copper based spray such as Bordo. In a perfect garden you would have started doing this much sooner but there’s always next year. Chipmunks, no answer. I try to trap and relocate but there seems to be a never ending supply. Dorothy Asks? We regularly do garden battle with squirrels (quite a lot), rabbits and raccoons. This summer some critter is chewing off my bulb lilies at the base. I know it is an animal as I can see the teeth marks. Have you any sense of what animal would do this? This will influence my strategy, but I will definitely give Linda's black mesh a try. Ken Answers! My guess would be rabbits. Raccoons rarely chew on plants and it seems to me that the Lilies might be a bit large for a Squirrel to take on. Definitely try the black mesh. I’m going to try it in several locations. Maybe if I cover the whole yard in it the critters will stay next door. Thank you to all of my readers who gave me their tips and tricks to get my water hyacinths to bloom. I’ll try them and report back.